Nightmare Machine, a spin-off of Dream Machine, is one of the seasonal Halloween-themed pop-ups to hit New York City. Like Dream Machine, Nightmare Machine belongs to the number of exhibitions and art installments centered around social media. This relatively new phenomenon of "Instagrammable" exhibits has taken New York City -- and social media -- by storm. Nightmare Machine begins with an extraterrestrial-themed, fluorescent-lit room. 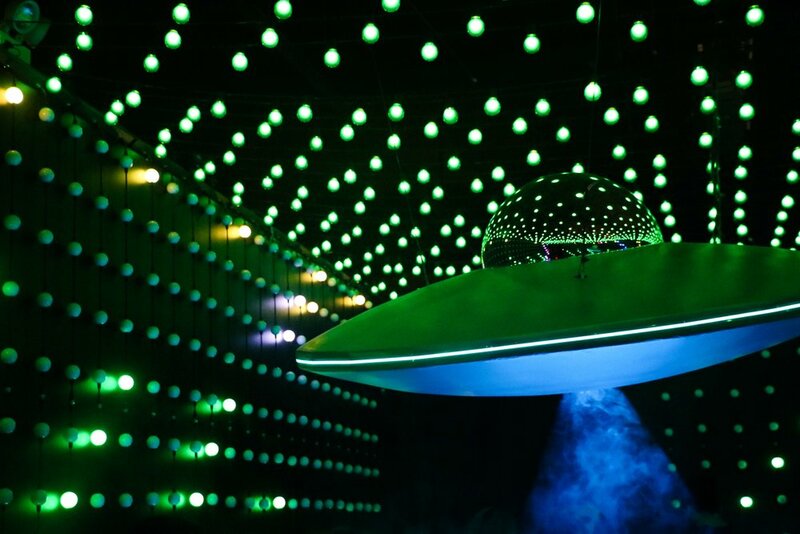 The walls are lined with lights, and a number of UFOs hang from the ceiling. Fog machines fill the room with clouds, giving the photos an eerie mood. 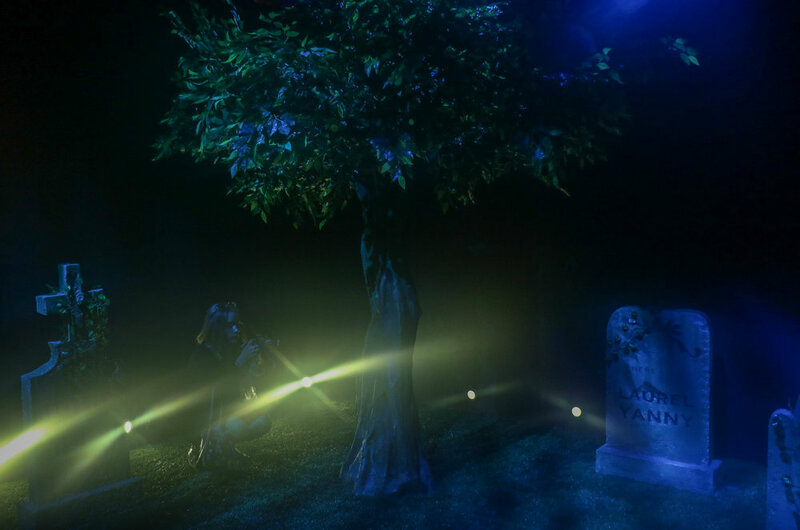 The following room features a graveyard with tombstones engraved with quirky, amusing phrases such as "L Train," "died from not forwarding that text message to 10 people," and "HERE LIES LAUREL AND YANNY." Up next is a nearly vacant room featuring a throne of cockroaches. Luckily, they are merely plastic. There are also plastic critters scattered on the floor and on the walls. Afterwards, visitors are guided into an abandoned laundromat. There are rows of cotton candy "lint" for guests to snack on while they take pictures in laundry carts. Behind the wall of washers and dryers is a dark "meat room" for those brave enough to enter. Visitors are then led through an esophagus corridor, where the walls resemble a more viewer-friendly rendition of human inner organs. The esophagus corridor leads to the pit of hell itself: a hellish ball pit with animated fire dancing up the walls. Guests are invited to climb up the stairs and jump in -- as long as they don't step on the lava. Viewers enter the next room through the mouth of a demonic clown into a sea of silver ribbon hanging from the ceiling. Masks attached to the ribbon reflect throughout the room and the ribbons are so thickly hung that guests have no sense of how far they have gone or how long of a walk they have until they emerge. The final stage of the exhibition is a brightly lit room with blood splatters covering the walls. Guests are invited to take pictures on a surgical table, on which was a pool of blood. Whether visitors leave the exhibition spooked or unshaken, one thing is for sure: they will definitely capture a lot of great photos. *Nightmare Machine is wheelchair accessible.